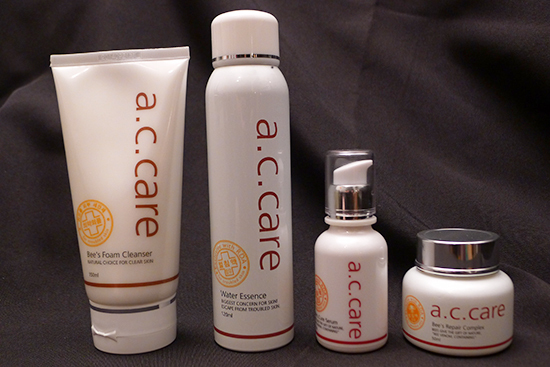 The A.C. Care Cosmetics Skin Repair line came to me at an interesting time– not only was my hormonal acne in high gear, but my Retin-A prescription had also run out, and it would be another few weeks before I could get in to see my dermatologist. 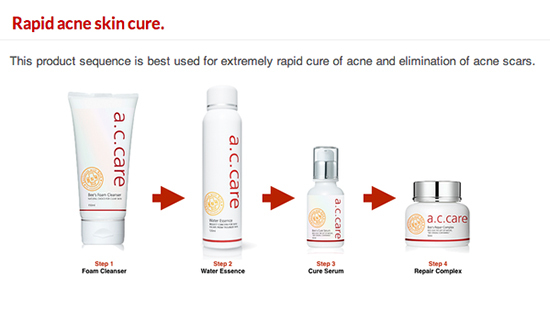 When I was given the opportunity to put A.C. Care’s entire Skin Repair line to the test, I jumped at the chance. My skin was a hot mess, so this product range certainly had its work cut out for it. One of the things I thought was really cool about the A.C. Care line was the product map. The product map contains details about which products to use for different skin conditions. Because I was experiencing so many active breakouts, I opted to use the “rapid acne skin cure” lineup, which prescribes the Skin Repair line’s foam cleanser, water essence, cure serum, and repair complex. Over the next couple of weeks, I’ll be reviewing all of the “rapid acne skin cure” products, starting with today’s look at the A.C. Care Bee’s Foam Cleanser. 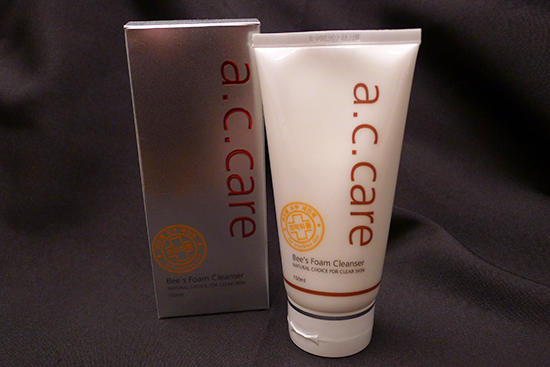 A.C. Care Bee’s Foam Cleanser ($35) is a foaming face wash. According to the A.C. Care website, this face wash boasts a delivery system that allows the actives it contains to deeply penetrate the skin, remove excess keratin and sebum, deep clean, and unblock pores. Lauric Acid – Lauric acid is a medium chain fatty acid derived from coconut oil. It’s a bit of a gamble as far as anti-acne ingredients go – there are many people for whom Lauric Acid is highly comedogenic. However, for those who tolerate lauric acid well, it’s an excellent anti-acne ingredient, thanks to its antimicrobial properties. This 2009 study from the University of California Division of Dermatology shows lauric acid to be an effective acne therapy both in vitro and in vivo: Antimicrobial property of lauric acid against Propionibacterium acnes: its therapeutic potential for inflammatory acne vulgaris. Sodium Lauroyl Glutamate (SLG) – SLG is a mild, amino acid based ingredient derived from lauric acid. This ingredient acts as the primary foaming agent in this cleanser, and is safer for sensitive skin than other, more commonly used detergents used in foaming cleansers (such as Sodium Lauryl Sulfate). Cocamidopropyl Betaine – This ingredient is another lauric acid derived foaming agent, and far gentler on the skin than Sodium Lauryl Sulfate. Beeswax – A moisturizing ingredient with anti-inflammatory and anti-bacterial properties. Allantoin – A natural compound that is anti-inflammatory, moisturizing, and exfoliating. Salicylic Acid – Salicylic Acid is a beta hydroxy acid (BHA) that is often used as an acne treatment. It is a naturally occurring ingredient, usually derived from willow bark, but also occurs in other sources, such as aloe. It’s antimicrobial, anti-inflammatory, and an exfoliant. Salicylic Acid has been shown in multiple studies to improve barrier function and collagen production. According to COSDNA, there are a few red flags in terms of potential acne triggers and irritants in A.C. Care Bee’s Foam Cleanser. One of them is Potassium Hydroxide, which ranks a 5 out 5 as a potential irritant. This ingredient is extremely caustic if it should come in contact with the skin on its own. In this formula, however, it acts as a pH adjuster – because it’s balancing out a highly acid formula, it’s already been reacted, and is therefore no longer an irritant. As a side note, Potassium Hydroxide is sometimes called “Caustic Potash,” a name that I find hilarious. It sounds like the name of a canned food an old-timey cowboy might eat while he’s out on the trail. Lauric acid scores a 4 out of 5 as a potential acne trigger. As previously mentioned, lauric acid can be comedogenic for some people, but those who do not have issues with it will reap its anti-acne benefits. Also worth mentioning is Myristic acid, another lauric acid derived emulsifying ingredient, which scores a 3 out of 5 as a potential acne trigger. For me, this is a great ingredient list, despite the warnings about lauric acid and the lauric acid derived components. I fall into the group of people who do not experience any comedogenic effects from lauric acid, so I get the anti-microbial effects and the benefits of a gentler foaming agent than SLS, without the pore-clogging side effects. Others may not be so lucky. A.C. Care Bee’s Foam Cleanser comes packaged in a tube – pretty standard as far as foam cleansers go. 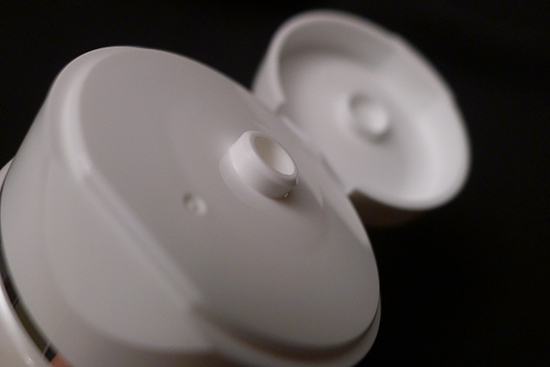 The packaging is hygienic, and I find it easy to control the amount of product I’m dispensing from the tube. 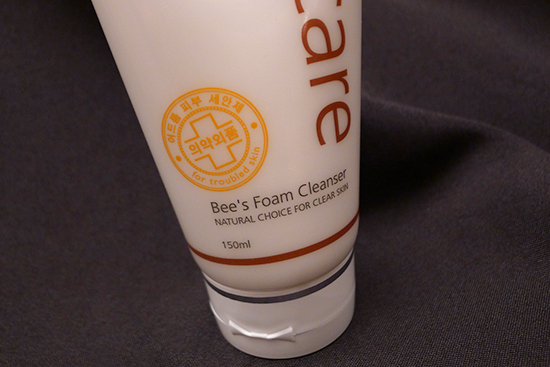 A.C. Care Bee’s Foam Cleanser has a pleasant, ambiguously soapy scent. It’s neither feminine nor masculine, and I did not find it overpowering. The scent does not linger once the product has been rinsed. After completing my oil cleansing step, I apply a coin-sized amount to my wet face and massage it around, careful to avoid my eye area. After about 30 seconds, I rinse it off with lukewarm water. 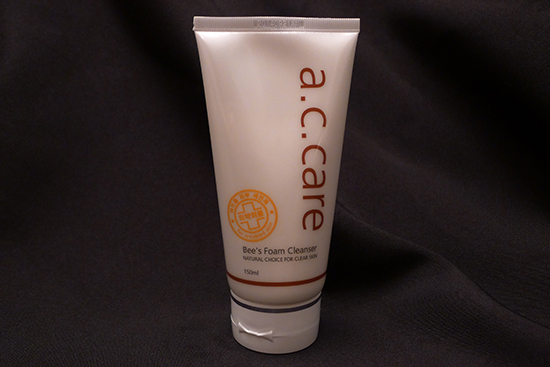 I really enjoyed A.C. Care Bee’s Foam Cleanser! It has all the rich, moisturizing, foaming action of a good foaming cleanser, but without the drying sulfates. 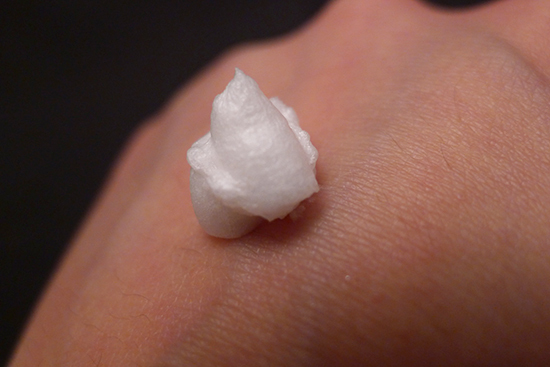 Sometimes I find that an SLS free formula, though safer and preferred, just doesn’t give me a fully enjoyable foaming experience, but the A.C. Care Bee’s Foam Cleanser definitely delivered on that front. I’ve been using this cleanser for a little over 6 weeks, and definitely notice that my skin looks a bit brighter. This effect is mostly temporary, and is most visible in the hours just after cleansing, but I do think it has helped somewhat with my post-inflammatory hyper-pigmentation. However, it’s hard to say whether this cleanser is doing the lightening, or some of my other products with PIH lightening ingredients. A.C. Care Bee’s Foam Cleanser does a great job making my skin feel really clean without drying it out. This was surprising for me since I often find that cleansers containing salicylic acid leave my skin feeling tight and parched. I’ve been using this cleanser in conjunction with the rest of the A.C. Care Skin Repair line, and I did notice a reduction in active acne during my use of the range. Frankly, it’s difficult to gauge how much of the acne-fighting work the cleanser was doing on its own, but I enjoyed using it. I think the cleanser might be one of my favorite products in the range. Value: 3/5 – $35 is pretty steep for a cleanser, but a little goes a long way and there is a lot of cleanser in the tube. I’m still using it, but expect that I’ll get around 2 months of 2x daily usage out of it. You can find Bee’s Foam Cleanser on the A.C. Care Cosmetics website, where it retails for $35. It’s currently on sale for $29. This article features press samples that were sent to me for my unbiased consideration. Any opinion expressed is 100% my own. For more information about my review policies, see my full disclosure. I agreed with Kerry. It’s a pretty decent cleanser that does the job. But, since I like to try new products, I didn’t repurchase it. Currently I’m using Leaders Insolution cleanser, which I personally prefer over AC care foam cleanser. I’ll have to try the Leaders Insolution Cleanser! I tried a different Leaders cleanser – The Perfect Clearing Foam, I believe – and had terrible luck with it. I could never seem to rinse it off completely! That was the cleanser I was talking about lol. I actually like it. It clears my acne better than the A.C. care bees foam cleanser. I have acne prone skin and the leaders cleanser the perfect clearing foam is doing a decent job. I can’t wait to try Leaders AC stop foaming cleanser. I’m also on a quest to find my HG cleanser. I’ve tried 4 so far and they have all done nothing for my skin/irritate it. And do AC stuff really work? I thought it was just a whole bunch of chemicals put together that isn’t that great for long term. Currently waiting on Missha’s Fermentation Foam cause it sounds interesting and I could not find a single review on it. I also feel really bad for forking out money on those cleansers and not touching them again… On a student budget! You know, my HG (non-oil) cleanser is actually an American one – it’s Cerave Foaming Cleanser. I adore it. It’s really more of a gel cleanser than what I would typically think of as a foam cleanser. It has all kinds of skin-healthy ingredients such as ceramides, niacinamide, and hyaluronic acid, with no added fragrance or harsh detergents. It’s also super affordable here in the states – I can get a huge 12 oz. bottle of it for less than $15 at the drug store. I tried the Cetaphil Gentle Cleanser after reading the high raves and positive reviews on makeupalley and was seriously disappointed so have been put off by drugstore products. I live in Australia so I think the cheapest I could find it was on Ebay. There are 2 designs for the bottle, what’s up with that? Is one a more recent design meaning it’s more fresh? I’d love to try it out, the ingredients do look refreshing. Ah, I had a huge reaction to Cerave. It took 2 days for the rash to go. Luckily, Amazon refunded the money. I did like both the skin & lotion cause they were light and smelled really good! 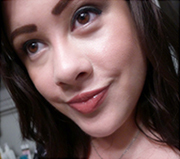 But, I vaguely remember when I stopped using it (I think after like 3 days or so, because it made my skin tingle a bit, and I was just paranoid about putting bee venom on my face at that time, LOL), a few days later, I got a really bad (cystic) breakout…I don’t know if it was coincidental or if the skin & lotion caused it to happen. Yeah, it’s very hard to say. Coincidences do happen, and you used it for such a short period of time. Still, there’s really no telling – skin can be so finicky and it’s always hard to guess what we’ll be sensitive to. I have the skin and lotion, but haven’t tried it yet. I’m looking forward to seeing how it works out! You were saying your skin has been a hot mess and you just recently updated your skincare routine to contain majority of Benton’s products. Could these products be the culprit? Just curious because I started using their products and my skin has been breaking out quite a bit. The snail bee essence gave me no problems and was great. But once I added the BHA toner I started getting a few little painful bumps. I did some research and found that BHA products can cause some initial purging. But i’m a bit skeptical of the whole purging concept. Was Benton products the cause of your skins troubles? should i wait it out and see if it continues to break me out or stop using it? 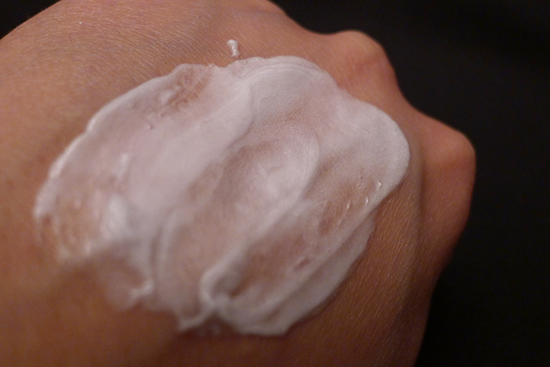 In regard to purging – purging when starting a BHA, AHA, or retinoid is real and common. However, the bumps you’re describing don’t sound like purging because you mentioned they’re painful. Are they cystic, the bumps? Purging breakouts manifest as small bumps/whiteheads in areas where you would normally break out, and they aren’t usually painful. If the bumps aren’t cystic and fit the description of purging, I think it would be worth it to keep using the toner for another week and see if the bumps start disappearing. If the bumps are large, painful, and appearing in areas you wouldn’t normally break out, you should stop using the toner – it is possible your skin doesn’t agree with one of the ingredients. Are you able to use this stuff while breastfeeding since most of the products contain bee venom? I can’t find anything online about this. Please help. Did you test the ph of this cleanser? When I tried, it seemed high, 7 or more.